Yes, there is a “Kitten Season,” and it’s happening now! Kitten season sounds adorable, and in many ways it is, but it’s also a bit terrifying. Every year between March and September, hundreds of kittens are born in Mendocino County, if not thousands. 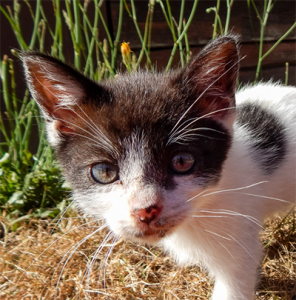 Although Fort Bragg is fortunate to have a no-kill shelter, there are limited available resources for addressing orphaned or unsocialized kittens. In working with the Mendocino Coast Humane Society, we hope to address the issues surrounding kitten season. Here’s the deal: kitten season is the result of unfixed cats mating in high numbers, resulting in excessive amounts of kittens popping up in our community. Excellent programs like the Eileen Hawthorne Fund assist with spay and neuter funding, helping hundreds of cat owners afford the costs of spay and neuter each year. Still, high number of kittens are turning up both in homes and outside each kitten season. Kittens outside… that sounds awful right? Well, here is how the community can help us. If you come across kittens outside and alone, do not assume they have been abandoned and remove them from their location. It is possible the mama cat will return to the kittens soon. Keep in mind that if kittens are still nursing (under 6-7 weeks old), their best chance for survival is their mama cat. Instead, call the Coast Cat Project (707-969-7781) so we can survey the situation and determine the best solution for the kittens and their mother. This could include orphaned kitten care, medical attention, spay and neuter for all the cats, and re-homing socialized kittens. Wait to see if mama cat comes back. It is likely that mama has to go find food or hunt and may be gone for several hours. Do not pick up or relocate the kittens. If there are signs of injury, starvation, or illness, call us right away to pick up the kittens or offer specific advice for caring for the kittens. Make sure kittens are safe during this time, such as keep your animals inside, cancel yard project using heavy equipment, etc. While you are waiting, contact Coast Cat Project at 707-969-7781 or complete this form to report kitten location. (FORM HERE) Do this right away so we can be alerted of the situation and start forming a game plan. If mama, comes back, let us know. We will try to capture the whole roost together or leave the kittens where they are until they at weening age. If mama does not come back, we will send in volunteers to rescue the kittens. For more information, contact the Coast Cat Project at 707-969-7781 or coastcatproject@gmail.com. For financial assistance in spay or neuter costs of your pet cats, call the Eileen Hawthorne Fund at 707-969-7877.